Planting in Sabah for rainforest conservation! Home/Climb Mt Kinabalu, Conservation, Danish Adventure Group, Groups & Schools, News/Planting in Sabah for rainforest conservation! 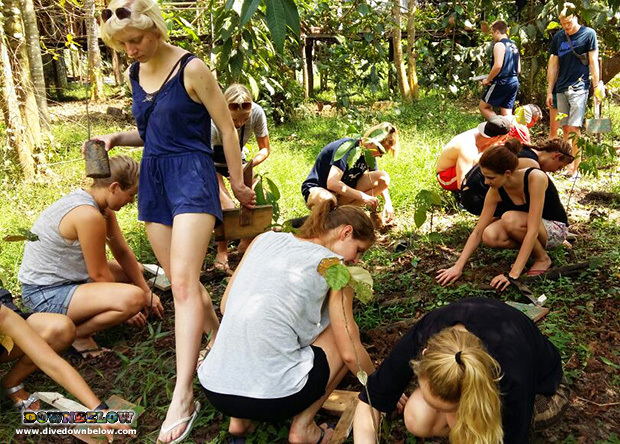 Before returning to Kota Kinabalu city centre, our Expedition Borneo group receive another practical lesson about tree planting in Sabah for rainforest conservation! Their itinerary is filled with the very best adventure activities and ecotourism-based attractions found in Sabah, which will offer the young adventurers’ a greater appreciation for the natural environment. For 30 days, the unique educational programs are conducted under practical experiences, such as planting young sapling trees that are endemic to the Kinabatangan River and Bilit Village area! Eventually, the terrestrial biodiversity will thrive! One epic challenge, which is probably the toughest in Sabah, is climbing to Mount Kinabalu’s Low’s Peak at an altitude of 4,095m! Before they begin each activity, they will receive a briefing of what to expect in a comprehensive presentation delivered at our Kota Kinabalu HQ, where its location is right next door to our Kota Kinabalu Dive Shop. This suits our participants very well, as they may purchase items they may have forgotten to pack. Contact our Sabah Travel Centre, where our experienced experts will be delighted to assist in creating a personalised itinerary for a travelling group of any size to experience beautiful Sabah, Borneo! By Joanne Swann|2015-04-13T11:23:16+08:00April 15th, 2015|Climb Mt Kinabalu, Conservation, Danish Adventure Group, Groups & Schools, News|Comments Off on Planting in Sabah for rainforest conservation!